Hello! 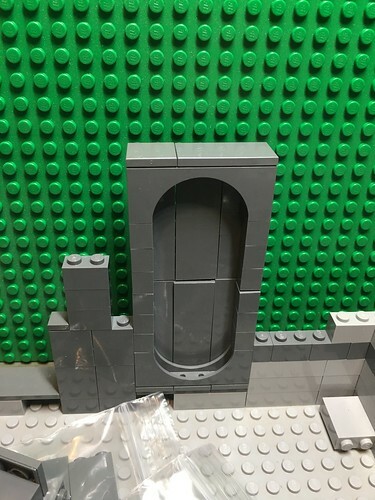 I am building a window and am trying to put antistuds together, as seen in the picture. I cannot figure out how to keep the two separate pieces together. Any help would be appreciated! 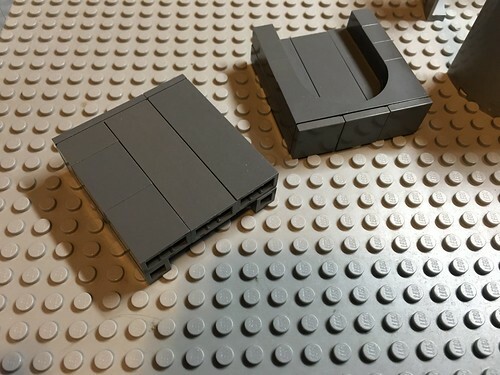 The simplest thing is probably to technic axles in there - 2L for the 1x1 bricks, and longer for the 2x1x6 bricks - as long as the sections will just rest one on top of the other and not have to resist any tension forces. sorry, I mean the 2x1x5 bricks; just hit the wrong key. Oh! Forgot to mention the 1x2x5's will be trans clear, Just don't have the parts yet. Thank you for the advice. If you're looking for a solution where you can stick everything together with studs so that the frame is flush, it will be much bulkier. It looks like you're building a wall to set this in, so that might be tractable. All right. I will play around with your suggestions and see how it works. Thank you for putting time aside to help me out. 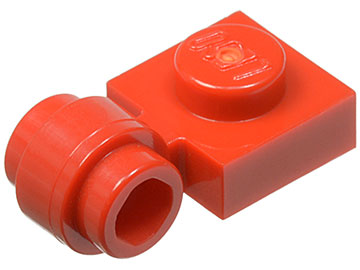 You could use 2 of part 36840 or 2 of part 36841 facing away from each other and a 1x2 plate and 1x2 tile connecting the hollow studs. My suggestion was similar to @TimeCruiser's above, but with brackets that are 2 studs wide instead of 1x1, since they are more common. Either way, you'd have to build them off to the side or front, though, but I think you'll find that's the case no matter what. You can always add something decorative there, or hide them behind an adjoining wall section. at the end of each pillar (four total) and hold the side studs together with a 1x2 tile. 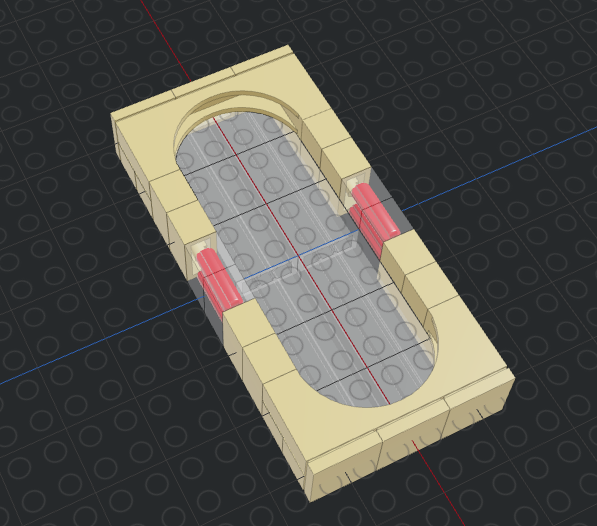 The side studs won't be an exact stud width apart, but since the 1x2 can span odd gaps it shouldn't be a problem. You might need to put a 1x1 plate on the underside of one set of modified plates so they don't bow out. Again, you'd need to build it off to the side and hide it. Thank you @TimeCruiser and @rodiziorobs for your suggestions. In trying them out I do get a bit of bowing as the space between the studs is slightly more than a 1x2 can cover, however it is very slight and once placed into the wall, I don't think it would look too bad. This would end up with a portion that isn't flush with the rest of the frame - as @rodiziorobs points out, this would be an opportunity to make a decorative detail. 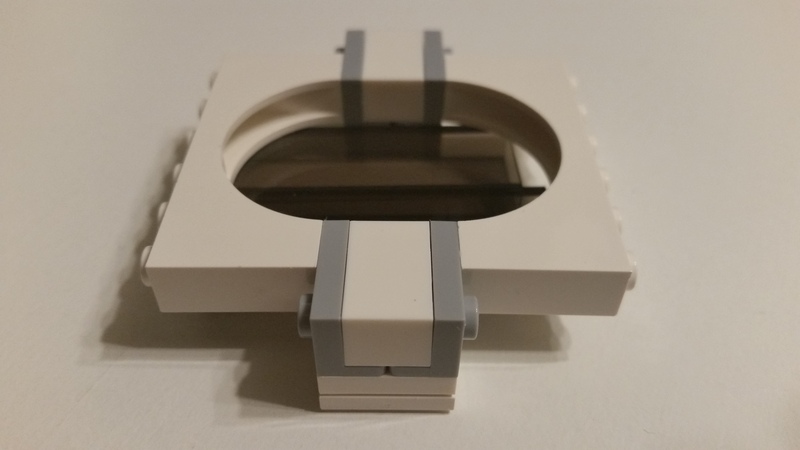 Here is a photo of what I had in mind using the 2 stud wide equivalent bracket 99781. I encountered a slight bowing also, which was more pronounced with 3 plates than with 1 brick between the brackets. Yeah new 1x1 brackets as TimeCruisers wrote (DBG ones are only upwards though, or headlight bricks instread. 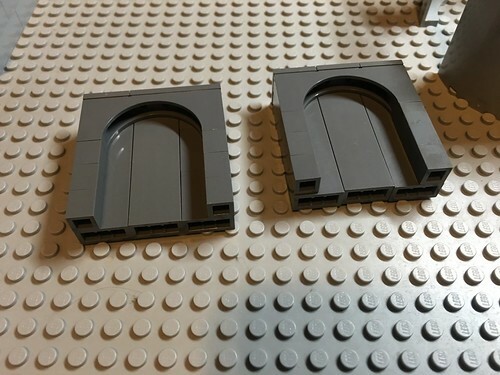 You should definitely replace 4 of the front bricks by 1x4 plate & tile, attaching 2 (or more) headlight bricks.I would even go for a 1x6 tile to have it more smooth in-between the arches. 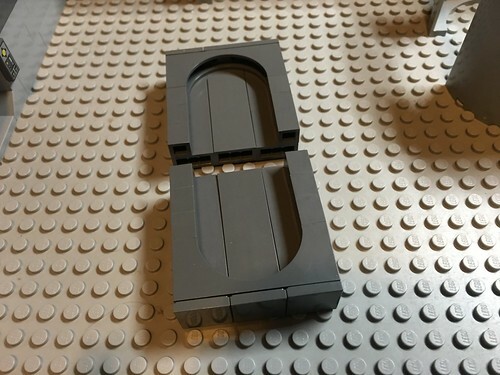 So instead of 6 bricks in the front you'd have 1 headlight + 2* 1x1 plates + 1 headlight + 1x1 plate, on each side. And you hold both by 1x6 plate+1x6 tile, with 4* 1x1 plates to extend the headlights.